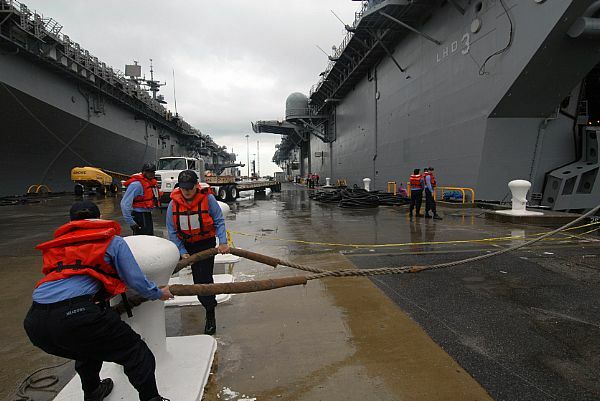 NORFOLK, Va. (July 30, 2007) - Linehandlers release the lines of amphibious assault ship USS Kearsarge (LHD 3) at Naval Station Norfolk. 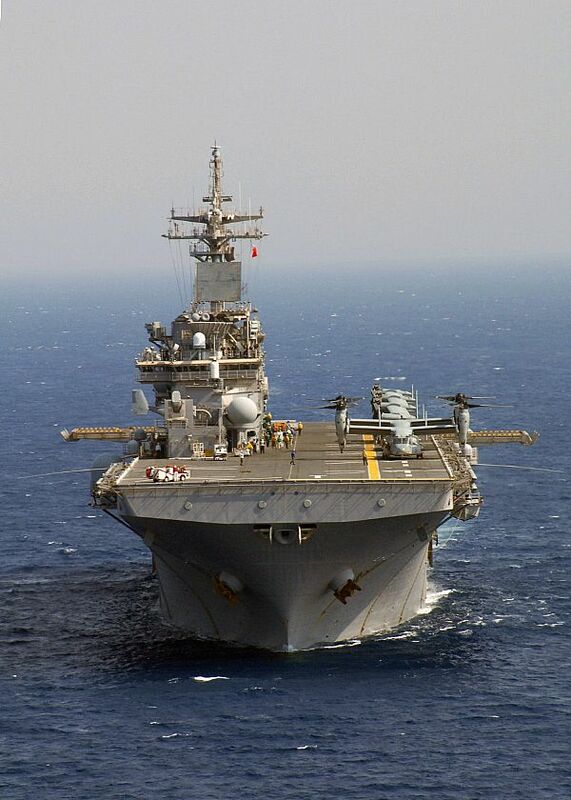 Kearsarge Expeditionary Strike Group and Marine Expeditionary Unit (MEU) 22 left on a scheduled deployment to conduct maritime operations in support of the ongoing rotation of forward-deployed forces. 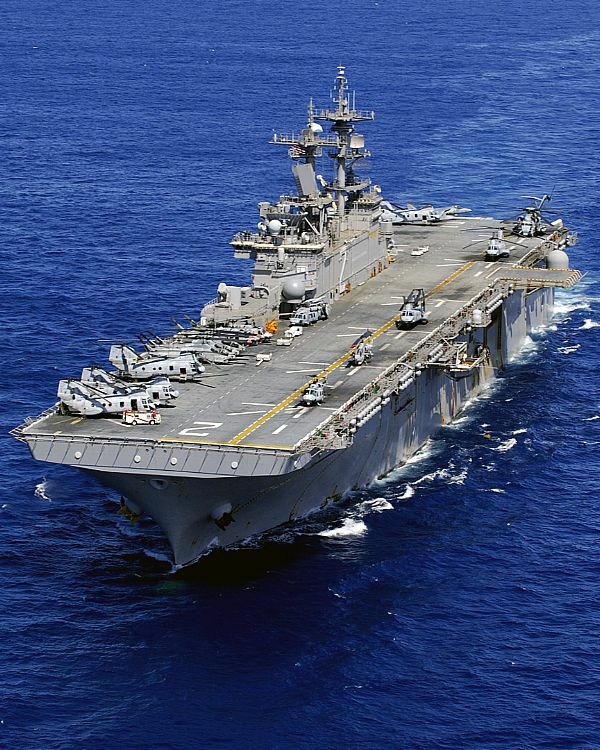 U.S. Navy photo by Mass Communication Specialist Seaman Mandy Hunsucker. GULF OF AQABA (Oct. 4, 2007) - U.S. Marine Corps MV-22 Ospreys, assigned to Marine Medium Tiltrotor Squadron (VMM) 263, Marine Aircraft Group 29, prepare for flight on the deck of the multipurpose amphibious assault ship USS Wasp (LHD 1). 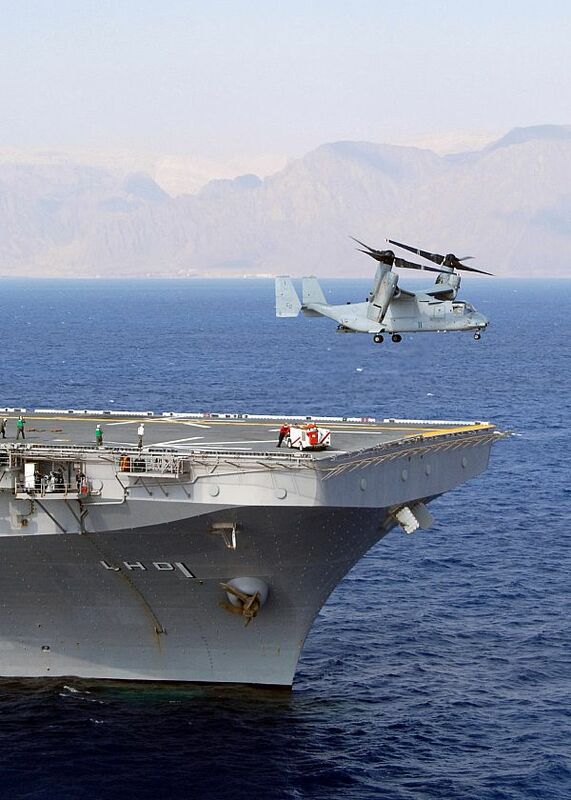 Wasp is on surge deployment to the Middle East carrying the Osprey to its first combat deployment. 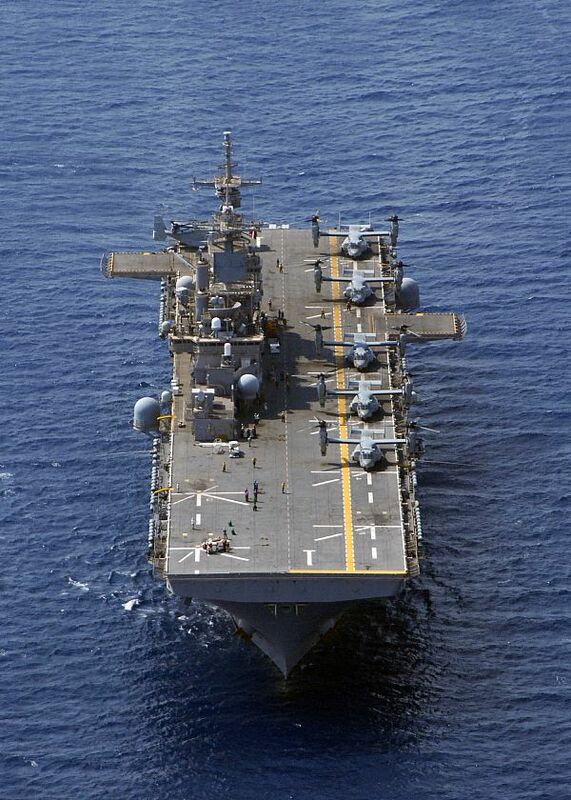 ATLANTIC OCEAN (Nov. 19, 2007) The amphibious assault ship USS Nassau (LHA 4) conducts flight deck qualifications with the air combat element of the 24th Marine Expeditionary Unit along with members of the Helicopter Sea Combat Squadron (HSC) 28. Nassau Strike Group is preparing for an upcoming deployment. SEA OF JAPAN (Feb. 15, 2007) The amphibious transport dock ship USS Juneau (LPD 10), steams behind the Essex Expeditionary Strike Group. 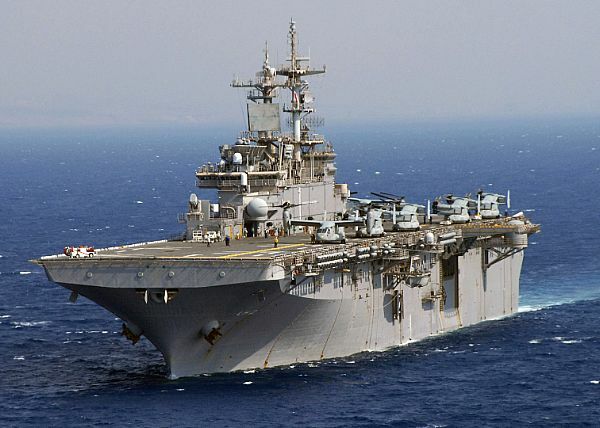 The amphibious assault ship USS Essex (LHD 2) is the lead ship of the only forward-deployed U.S. task force and serves as the flagship for Combined Task Force (CTF) 76. 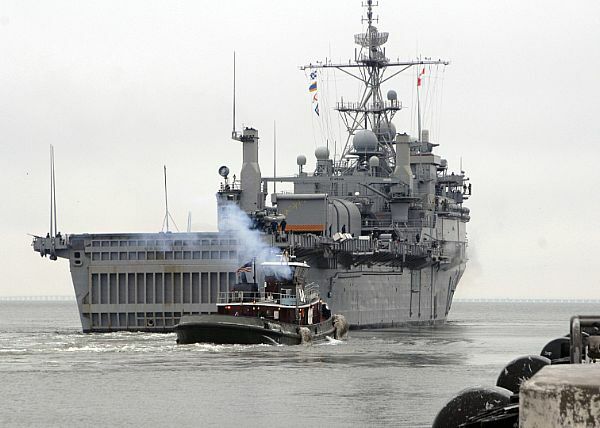 NORFOLK, Va. (Feb. 22, 2008) The amphibious transport dock ship USS Nashville (LPD 13) departs Naval Station Norfolk. 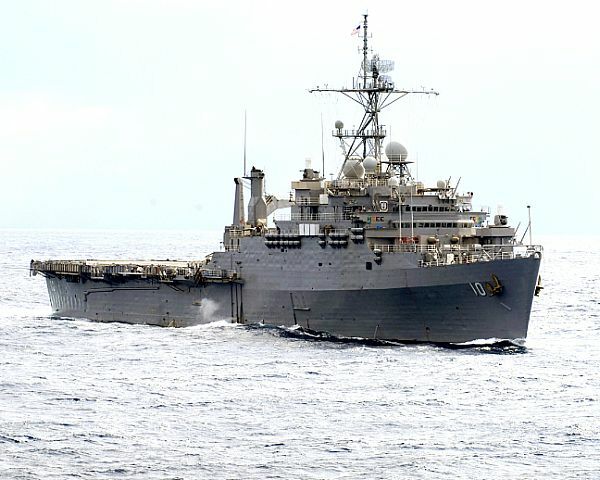 Nashville is deployed as part of the Nassau Expeditionary Strike Group in support of maritime security operations and Theater Security Cooperation efforts in the U.S. 5th and 6th Fleet areas of responsibility. 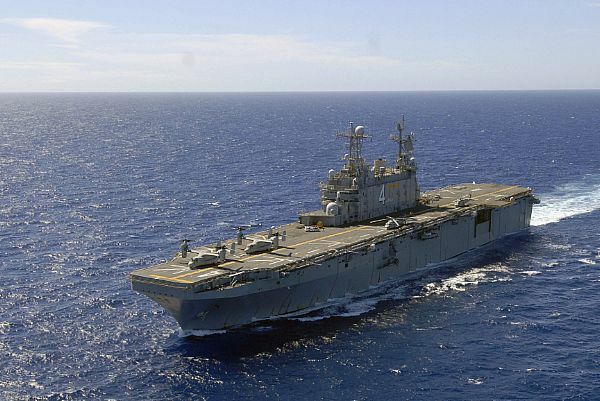 SOUTH CHINA SEA (Feb. 24, 2008) The forward-deployed amphibious assault ship USS Essex (LHD 2) steams in the South China Sea during annual navy bilateral training as part of Balikatan 2008. During the Balikatan 2008 humanitarian assistance and training activities, military service members from the United States and the government of the Republic of the Philippines work together to improve maritime security and ensure humanitarian assistance and disaster relief efforts are efficient and effective. On voit sur l'une des photo l'osprey. Le Boeing/Bell V-22 Osprey (Balbuzard) est un avion de transport militaire américain. Sa formule à rotors basculants lui permet de décoller et atterrir verticalement, comme les hélicoptères de transport lourds qu'il doit remplacer. C'est le premier avion de ce type et de cette taille à être construit en série, malgré les controverses sur la sécurité soulevées lors de son développement. Marquant l'aboutissement d'un projet commencé 20 ans plus tôt, la production en série du V-22 Osprey a finalement été lancée fin 2005. 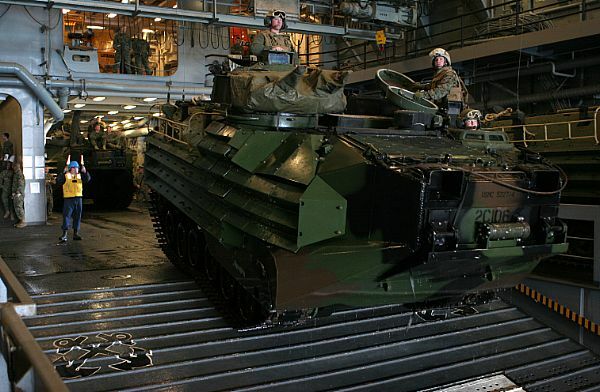 Au total, 458 exemplaires ont été commandés pour équiper trois composantes de l'armée américaine : l'US Marine Corps, l'US Air Force et l'US Navy. Cet avion / Héli est une prouesse de technologie. ATLANTIC OCEAN (Feb. 25, 2008) The amphibious dock landing ship USS Ashland (LSD 48 ) crosses the Atlantic Ocean during a scheduled deployment as part of the Nassau Expeditionary Strike Group supporting maritime security operations and theater security cooperation efforts in the U.S. 5th and 6th Fleet areas of responsibility. ATLANTIC OCEAN (Feb. 25, 2008) The amphibious assault ship USS Nassau (LHA 4) crosses the Atlantic Ocean during a scheduled deployment as part of the Nassau Expeditionary Strike Group supporting maritime security operations and theater security cooperation efforts in the U.S. 5th and 6th Fleet areas of responsibility. 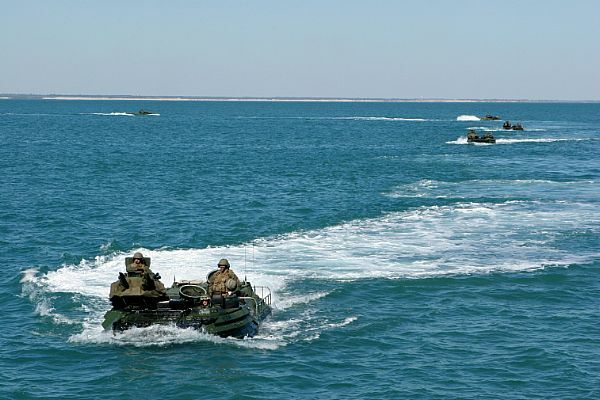 ATLANTIC OCEAN (March 9, 2008) U.S. Marine Corps amphibious assault vehicles sail near the amphibious dock landing ship USS Carter Hall (LSD 50). ATLANTIC OCEAN (March 9, 2008). U.S. Marine Corps amphibious assault vehicles approach the well deck of the amphibious transport dock ship USS San Antonio (LPD 17). 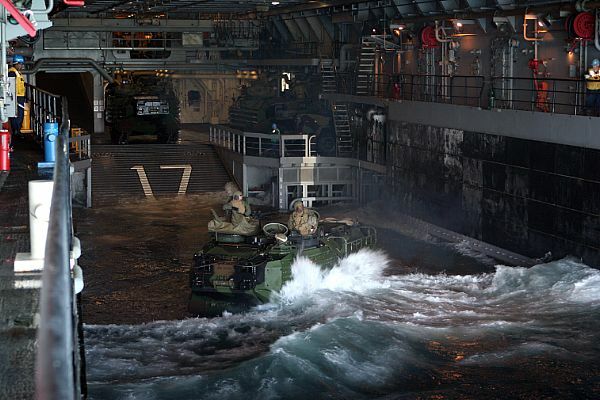 A U.S. Marine Corps amphibious assault vehicle enters the well deck of the amphibious transport dock ship USS San Antonio (LPD 17). 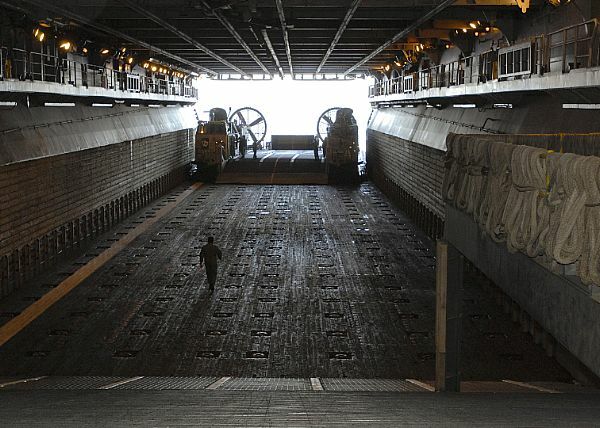 A U.S. Marine Corps amphibious assault vehicle spins onto the ramp of the vehicle stowage area inside the well deck of the amphibious transport dock ship USS San Antonio (LPD 17). 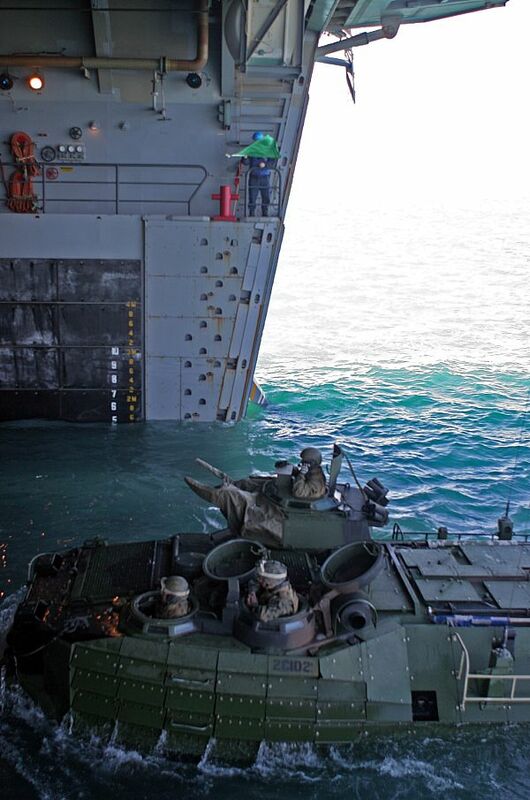 A U.S. Marine Corps amphibious assault vehicle backs up a ramp as it is guided onto the vehicle stowage area inside the well deck aboard the amphibious transport dock ship USS San Antonio (LPD-17). 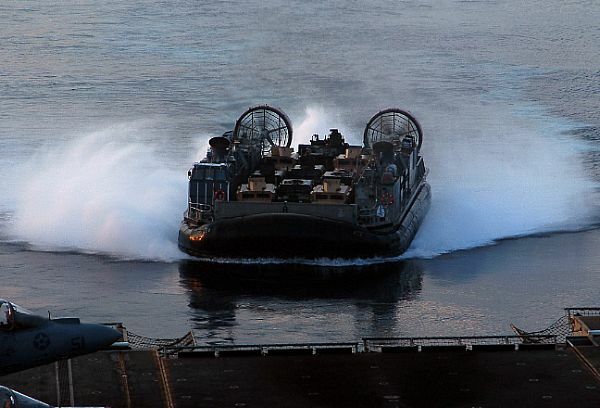 PERSIAN GULF (March 11, 2008) Landing Craft Air Cushioned (LCAC) 8 approaches the well deck of the amphibious assault ship USS Tarawa (LHA1). 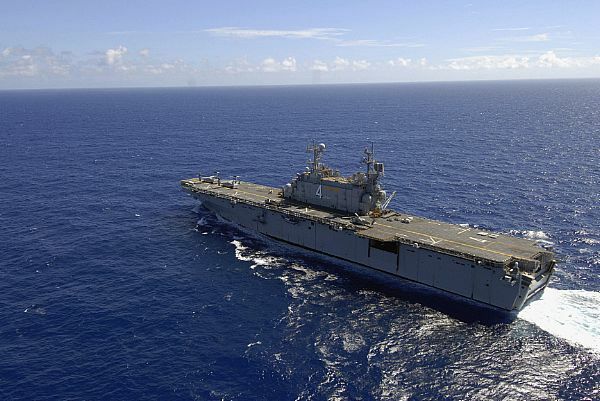 Operations in the U.S. 5th Fleet area of responsibility are focused on reassuring regional partners of the Coalition's commitment to help set conditions for security to help promote regional stability and global prosperity. PACIFIC OCEAN (March 10, 2008) A sailor assigned to Landing Craft Air Cushioned (LCAC) 21 returns to his craft in the well deck of the amphibious assault ship USS Boxer (LHD 4). 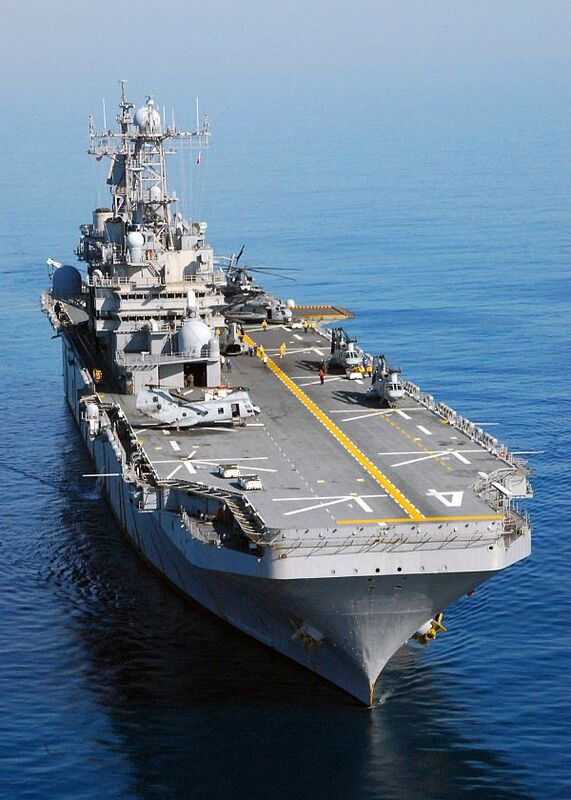 Boxer completed well deck certifications for LCAC and other landing craft operations while underway off the coast of Southern California. 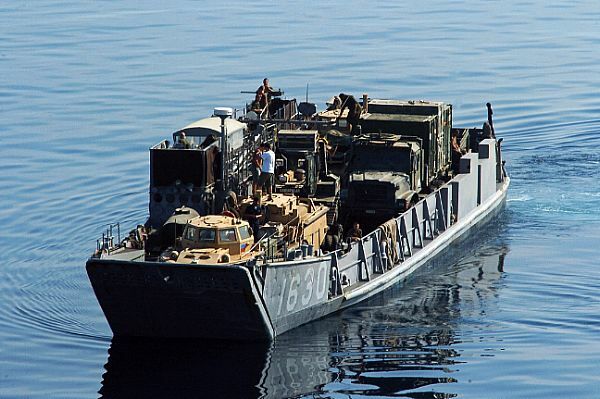 PERSIAN GULF (March 11, 2008) Landing Craft Utility (LCU) 1630 takes station after after launching from the well deck of the amphibious assault ship USS Tarawa (LHA 1). 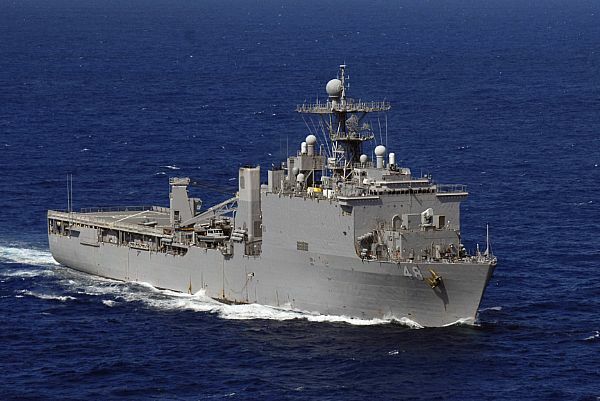 Operations in the U.S. 5th Fleet area of responsibility are focused on reassuring regional partners of the Coalition's commitment to help set conditions for security to help promote regional stability and global prosperity. Souda Bay, Crete (March 14, 2008) The Whidbey Island-class dock landing ship USS Ashland (LSD 48 ) arrives at the Marathi NATO Pier Facility for a routine port visit. 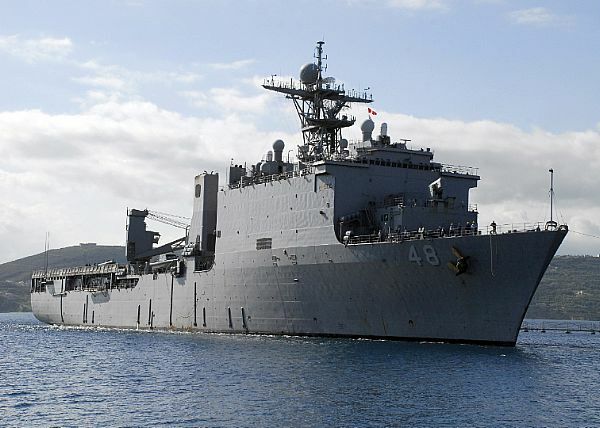 Ashland is homeported at Navy Amphibious Base Little Creek, Va. and is deployed supporting maritime security operations.